A lot of women are very worried that after an embryo transfer if they strain, or cough, or get up, or lift heavy weights, they will cause the embryo to " fall out " of the uterus. They feel that the embryo inside the uterus is exposed to mechanical pressures , and increasing the intra abdominal pressures by coughing, or going to the bathroom, or straining, will cause the embryo to fall out of the uterus. This is simply not true. Mechanical forces are extremely important during the process of the actual embryo transfer when the doctor has to be very careful and gently place the embryo into the uterine cavity using a catheter. This is a procedure which needs to be done with patience and time and gentleness and care because excessive handling of the embryo at this time can definitely cause the embryo to suffer insults which will prevent it from implanting. 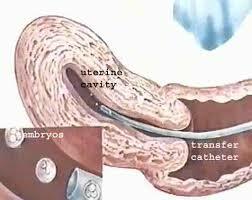 However, it’s only the mechanical process of transfer during which the embryo is subjected to mechanical influences. Once the transfer itself is over and the embryo is safely inside the uterine cavity , then mechanical forces no longer have a role to play. Inside the uterus, the embryo is actually shielded from all these forces. It is safe and secure, much like a pearl in an oyster and can happily continue to grow because then the only factors that affect its fate are biological factors, for example, its genetic competency or the in utero environment. Once the embryo is inside the uterus, mechanical forces really have no further role to play, which is why after the transfer, patients can rest assured that their embryos are safe inside the uterus and nothing they do can either reduce their chance of getting pregnant or, for that matter, increase the chance of implantation either. This is not very intuitive because patients think of their embryos as being very fragile, and want to do their best to "protect" them. Sadly, a lot of doctors add to these myths by advising " strict bed-test" after the transfer, and they are then confined to sleeping in bed. This is terrible advice, and can actually reduce pregnancy rates, because of the mental stress enforced bed rest inflicts on healthy young women. If your doctor advises bed rest after your embryo transfer, this is a red flag which means you need to find a better IVF doctor ! Please send me your medical details by filling in the form at www.drmalpani.com/free-second-opinion so that I can guide you !